Enjoy the pool with the entire family. 1 lane is available for lap swimmers. Private lessons are also scheduled at this time. The WAC Tri/Cycle Club meets in the Helene Madison pool for a team swim. 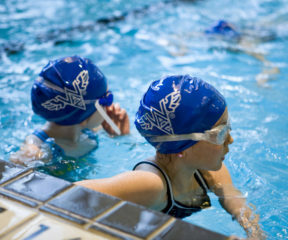 All lap swimmers welcome to attend this fast-paced, busy swim time. For details on joining the Tri/Cycle Club, email tricycleclub@wac.net. WAC Juniors Swim Team practice with coaches Emily Silver and Simona McIntyre, and Juniors pre-competitive team practice with Todd Kowalski. 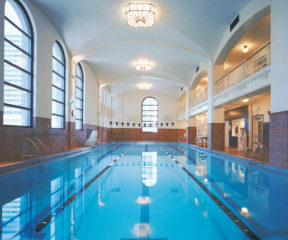 Come in for a quick Masters swim workout coached by a USMS Certified Coach. Open to all lap swimmers and Tri-Cycle members! Ages 3-5. Comfort in the water with an instructor, but minimal independent swim skills. Learn breath control and swimming on front and back with assistance. GROUP SWIM LESSONS — PRESCHOOL 1A – 8:30 A.M.
Ages 2-3. This level is designed for brand new swimmers, age 2-3 years, who are too old or advanced for tiny tots. 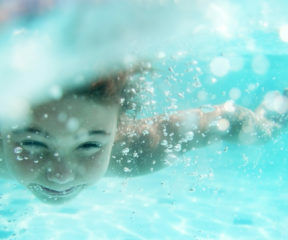 This class is designed to help kids become comfortable in the water. All skills are performed with a teacher and parent. GROUP SWIM LESSONS — LEVEL 4 – 8:30 A.M. Swimming 13 yards crawl stroke with side breathing. Endurance to swim the length of the pool on front and back. 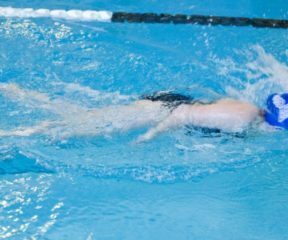 Developing technique for butterfly and backstroke. GROUP SWIM LESSONS — LEVEL 3 – 8:30 A.M.
Ages 6+. Swimming 10 yards crawl stroke. Comfort in deep water. Technical foundations for breast stroke, crawl stroke, and elementary backstroke. GROUP SWIM LESSONS — PRESCHOOL 3 – 9:05 A.M. Swimming three yards on front and back. Good breath control. Establishing foundations for crawl stroke and elementary backstroke. Ages 3-5. GROUP SWIM LESSONS — PRESCHOOL 1A – 9:40 A.M.
GROUP SWIM LESSONS — LEVEL 4 – 9:40 A.M. Swimming 13 yards crawl stroke with side breathing. 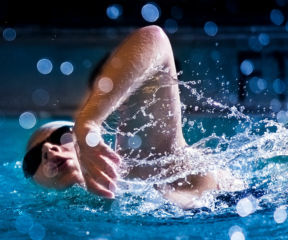 Endurance to swim the length of the pool on front and back. Developing technique for butterfly and backstroke. Note: This level 4 class is 30 minutes, ending at 10:10am. 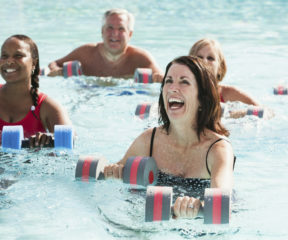 GROUP SWIM LESSONS — LEVEL 5 – 9:50 A.M.
Level 5: Swimming all four race strokes (crawl stroke, backstroke, breast stroke, and butterfly) 13–25 yards, refining coordination. Fundamental understanding of stroke mechanics. GROUP SWIM LESSONS — PRESCHOOL 2 – 10:15 A.M.
Parent/Child LESSONS — Tiny Tots – 10:15 A.M.
Ages 6 months – 3 years. 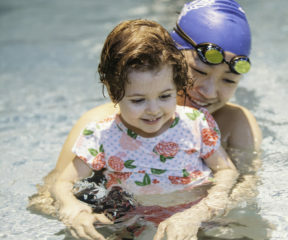 Infants learn water-adjustment techniques and basic water skills. 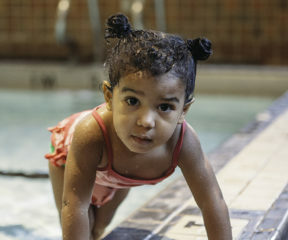 Toddlers learn water adjustment, water skills, and introduction to swimming. Each child must be accompanied by at least one adult in class. GROUP SWIM LESSONS — LEVEL FAST – 10:30 A.M. Fundamentals Approaching Swim Team (FAST), focuses on building endurance and refining the four primary strokes, starts and turns. Great as an introduction to swim team, or for swimmers looking to get in another day of practice. GROUP SWIM LESSONS — PRESCHOOL 1 — 10:50 A.M.
Ages 3-5. Brand new swimmers! 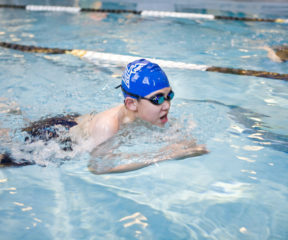 This class is designed to help kids become comfortable in the water. All skills are performed with a teacher. 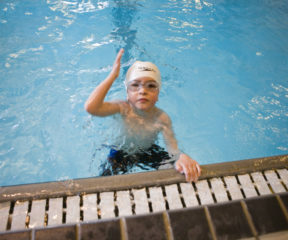 GROUP SWIM LESSONS — PRESCHOOL 2 – 10:50 A.M.
GROUP SWIM LESSONS — LEVEL 6 – 11:15 A.M.
Level 6: Swimming all four race strokes (freestyle, backstroke, breast stroke, and butterfly) 13–25 yards, refining coordination. Fundamental understanding of stroke mechanics. GROUP SWIM LESSONS — LEVEL 2 – 11:25 A.M.
Ages 6+. Swimming five yards on front and back. Good breath control. Establishing foundations for crawl stroke and elementary backstroke. GROUP SWIM LESSONS — LEVEL 1 – 11:25 A.M.
Parent/Child LESSONS — Tiny Tots – 11:25 A.M.
GROUP SWIM LESSONS — LEVEL 3 – 11:25 A.M.